The women - shown in photographs taken in 1929 - had been assumed to be tourists or visitors. But since Prof Dan Hicks, from the University of Oxford, tweeted the images they have been named as archaeologists working on the site. Those behind the search say it shows how women have been written out of the history of archaeology. Dr Antonia Thomas from the University of the Highlands and Islands told BBC Radio Orkney the photographs were "brilliant". But highly staged. 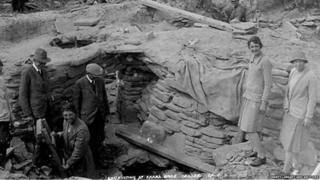 She says: "Everybody on site is looking towards Gordon Childe", who led the excavation of Skara Brae in 1928 and 1929. The Neolithic village at the Bay of Skaill on the west coast of Orkney's mainland had first been uncovered by storms towards the end of the 19th Century. "All the angles of the plans, the photographic scales, everything like that is angled to focus the eye towards Gordon Childe. "But just in the foreground, within the trench area, are two women who are laughing, and looking toward Gordon Childe as well." One of the women is clearly holding a trowel, and close examination of their shoes suggests they are covered in mud and dust. But despite that Prof Hicks says when he tweeted the images, at first "people shared the usual interpretations, and indeed the published interpretations, that these women were either tourists who were visiting the site or local women visiting the site on a day trip." Dr Mairi Davies from Historic Environment Scotland explained that despite the preconceptions, women were active in archaeology at the time. "Prof Childe had just started his professorship at Edinburgh University in the 1920's, and this was the first excavation that he did in Scotland," she said. "In the arts faculty at that time in some years there were actually more female students than male. And his classes reflected that gender balance. "So we know that there were several women in Prof Childe's classes at Edinburgh. And we know that some went on to be very active field archaeologists." And now, for the first time, it's been possible to identify the women as archaeologists, and supply names for them. One is thought to be Margaret Simpson, who gets an acknowledgement in Prof Childe's monograph about Skara Brae. A second is believed to be Margaret Mitchell, who graduated from Edinburgh with a PhD in archaeology. The third woman is probably Mary Kennedy. And it's thought the fourth is Dame Margaret Cole - the only one of the group who didn't go on to be an archaeologist. In fact, she later became a crime writer. Prof Hicks says it's only been possible to make those identifications because people have dug into the history of archaeology. "As archaeologists we make archives of ourselves, and that means that those archives can be excavated. "And seeing women who've been written out of the published accounts of the history of archaeology, and realising their key role in interpretation of archaeological sites, and in the development of archaeology as a discipline is very important." Image caption Those behind the "excavation" carried out on social media say women archaeologists have been pushed into the background. Dr Mairi Davies agrees with that. "Women have always been involved in archaeology", she says, "and not just sitting at desks writing books, but actually out in the field. Surveying. Excavating. Leading excavations, and so on. "So I think it's absolutely important for women to be aware that they're part of a proud tradition that stretches back well over a hundred years." Dr Antonia Thomas says she's annoyed with herself, for not seeing the details that were hidden in plain sight in the pictures. "What is interesting about this is, not only the fact that we so readily accept the given narrative without looking at the details - for example the fact that she was holding a trowel, which I'd never really noticed. "But perhaps we're maybe more inclined to do this when it's women in history, and female archaeologists particularly. "And I think it really does beg quite a few questions about why these women have not been more widely known."